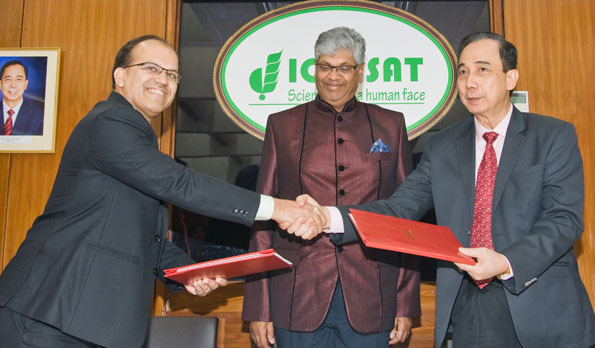 The Governing Board of ICRISAT has decided to boost its research in sub-Saharan Africa (SSA) by investing US$ 5 million towards upgrading research infrastructure and building scientific skills in the African continent. This investment will be across SSA where ICRISAT has its offices in Mali, Niger, Nigeria, Kenya, Zimbabwe, Malawi and Ethiopia. The Governing Board has requested the management to devise an investment plan for the next three years. Director General Dr William D Dar will work on this strategic initiative with the incoming Director General Dr David Bergvinson. “Food security is a major challenge at both the national and the household levels in SSA where many countries are below subsistence levels for calorific and protein intake levels per capita on a world basis. There is an urgent need to identify the best means of harnessing the required resources to further advance the productivity of smallholder agriculture in SSA. 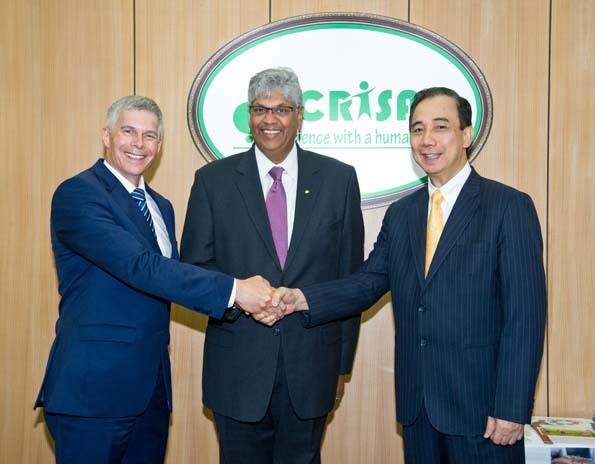 This will lead to greater self-reliance and resilience, particularly in light of climate change, and enable increased participation in the market economy,” said ICRISAT Governing Board Chair Dr Chandra Madramootoo. 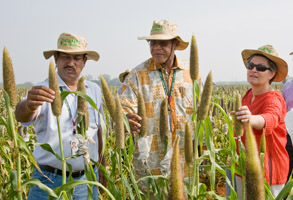 ICRISAT has strong links with governments, universities, private sector and non-government organizations in the SSA. 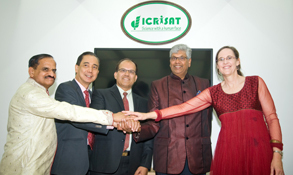 ICRISAT will facilitate research integration with various international, regional and national organizations, by building synergistic relationships with its partners. At the release of the ICRISAT IMOD Exemplars Volume-I, case studies from Africa and Asia. ICRISAT’s 2020 strategy was based on an Inclusive Market-Oriented Development (IMOD) approach. Two years on, ICRISAT commissioned an external review to assess the success of this approach. With feedback from almost 200 stakeholders and over 30 organizations across national agricultural research systems, private sector and development agencies in Africa and Asia, the expert panel identified that IMOD was recognized among partners as a positive and valuable approach and so now is the time to elevate this framework to global implementation and adoption. Be inclusive: We are the catalysts and bring expertise and enable the local people, communities and organizations to take a lead in developing the solutions. Disadvantaged groups as well like the poorest farmers, women and youth must be included and part of this. Market-oriented development: Farming must be a profitable business and this means linking poor farmers to markets. As an approach IMOD has gained traction, the review noted. “The panel recommends that ICRISAT has now enough initial experience operationalizing IMOD philosophy, and therefore it should come out with a comprehensive document to explain the IMOD brand to outsiders and serve as a guiding document for ICRISAT scientists and partners at all the levels,” said Dr MCS Bantilan, Research Program Director, Markets, Institutions and Policies, while presenting the recommendations and management responses to the report. The ICRISAT Governing Board has requested the management to work out a Business Plan over a three-year horizon to implement the recommendations. ICRISAT IMOD Exemplars Volume-I was released - a set of case studies from Africa and Asia which demonstrate on-the-ground successful initiatives of the value and impact of an IMOD approach. These IMOD exemplars were released by the Governing Board members, the Director General and the incoming Director General. establishing research-to-policy platforms to facilitate pro-poor transformation. These IMOD exemplars covered various innovations like microdosing and agri-business innovation platforms; and crops such as pigeonpea, chickpea, sorghum and pearl millet grown by smallholder farmers across the crop value chains. The review panel included Dr SS Acharya (Chair); Dr Amadou Abdoulaye Fall and Ms Grace Ngungi (members); and Ms Reema Nanavaty and Dr Derek Byerlee (key resource persons). They reviewed internal and external literature on value chains, small farmers, and inclusiveness, conducted field visits throughout Africa and Asia, and surveyed staff members and external stakeholders. The panel made 19 recommendations categorized under five themes -- IMOD execution, capacity building & HR; partnerships, awareness, communication and dissemination, and definitions and studies. It would have been difficult for the scientists to predict, 15 years ago when they started work in Kothapally a small village in India, that this would be such a successful model that it would be replicated across many states in India by companies as their corporate social responsibility and adopted by governments in India, China, Thailand, Vietnam and now recently the Philippines. There was severe water scarcity. Originally all 62 open wells were dry for half the year and women had to travel 2-3 km to fetch drinking water during this time. Small farm holders were migrating to the city for livelihood options during the dry season. Low crop yields and poverty were prevalent. Most critical to the success was not just the technical solutions, but the approach of setting up the consortium of partners and involving the villagers in developing the solutions. The consortium used a wilt-tolerant, high-yielding pigeonpea cultivar grown on broad bed and furrows (BBF), as an entry point. During the first season itself pigeonpea yield tripled, reaching 600 kg/ha and later 900 kg/ha. This immediate success and economic benefit to smallholder farmers triggered the strong community involvement and collective action. Subsequently, common activities such as rainwater harvesting structures benefitting the community were facilitated. In 1999, the first earthen check dam near the village was constructed which benefitted the nearby farmers’ wells and provided drinking water to animals. The Board members along with Director General Dr William D Dar and incoming Director General Dr David Bergvinson visited the village and interacted with farmers. “This place has become a global learning village for ICRISAT. The partnership that started 15 years ago has gone from strength to strength. I consider myself to be a villager of Kothapally. We are keen to continue this partnership with you. It won’t be easy always, but together we can learn,” Dr Dar said while addressing the villagers. The team visited the Adarsha watershed, milk collection center, SAB Miller-ICRISAT Spent Malt Initiative and check dams and were briefed on the recharge of open wells, low-cost water harvesting and groundwater recharge, drip irrigation for growing vegetables and decentralized wastewater treatment being practised in the village. Farmers also detailed how vegetable cultivation taken up as a result of increased water availability improved their livelihoods. “On behalf of the Governing Board of ICRISAT, we congratulate you on your success working with the institute. 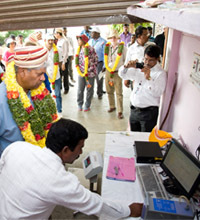 We thank you for your hospitality,” ICRISAT’s Governing Board Chair, Dr Chandra Madramootoo told the villagers. The President of the Watershed Committee, Mr Narasimha Reddy expresses his gratitude. ‘We would like to continue this partnership for life,’ Kothapally villagers told the visiting ICRISAT team. The 71st meeting of the ICRISAT Governing Board held at the headquarters from 22-25 September renewed and revitalized the Institute’s commitment to inclusiveness of smallholder farmers and partners especially women as the way forward to achieve food and nutritional security. Core to this is building stronger and more dynamic agricultural research-for-development partnerships. ICRISAT recognizes that the gender focus requires both and internal culture that supports strong women engagement as well as applying this throughout the research and development work. The Governing Board noted the strong participation of women in the Institute’s capacity building programs, sometimes even greater than 50%. The Board examined the gender integration into research of ICRISAT and the CGIAR Research Programs, how ICRISAT is ensuring women in scientific and senior positions and the support and encouragement to women staff for their professional development. This is a priority for ICRISAT and the Board regularly reviews performance indicators and approaches for further strengthening the implementation. Members of the Board also suggested extending support to the pool of gender experts in the CGIAR Research Programs. ICRISAT undertakes its work through partnerships and can only be successful especially by working with people on the ground. The Governing Board has emphasized the need to continually escalate linkages with partners – NGOs, policy makers, private sector, extension departments and universities. This was also highlighted as a key focus area in the IMOD review. analyze new and better ways to partner. The Governing Board has decided to extend the term of Dr Oluwande Muoyo on the Board by three years from 1 July 2015. Dr PK Mohanty will be replaced by Dr Rajiv Sharma in both the Program and Audit Committees of the Board. Dr Gry Synnevag will be the Chair of the Nominations Committee to replace Dr Meryl J Williams. Dr Nigel Wells Kerby will now be part of the Nominations Committee. Dr William D Dar made the most outstanding contribution to ICRISAT to help bring it to where it is today. We thank him very much for the legendary leadership that he provided to the Institute. It has been a pleasure to work with this distinguished individual; it is indeed a great honor, ICRISAT Governing Board Chair, Dr Chandra Madramootoo said in honor of ICRISAT Director General Dr William D Dar. The Governing Board honored Dr Dar for championing the cause of smallholder farmers across the world and for his immense contributions to the Institute over the past 15 years. His inspiring leadership brought the Institute to a new level of performance, achievements and visibility and created a vibrant institution, leading to laudable scientific breakthroughs. “For the past 15 years, I have been on a journey with ICRISAT to serve the interests of the smallholder farmers of Asia and sub-Saharan Africa using science with a human face. Without the strategic guidance of the Board the journey would have not been so smooth,” said Dr Dar thanking the Board for the strong, continuous and unqualified support. In his address, he emphasized that the strategic framework of Inclusive Market-Oriented Development will spell the future and success of smallholder farmers in the world. Dr Dar joined ICRISAT in the year 2000, when the institute had been hard hit by the declining priority of agricultural research and development within international assistance agencies, necessitating large budget cuts and morale-sapping staff reductions. 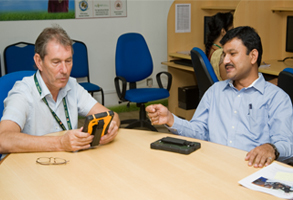 Under his transformational leadership, ICRISAT turned around and today is a leading institution in basic as well as applied agricultural research. Over the past 15 years, he has been recognized and awarded for his work, both nationally and internationally. The ICRISAT Governing Board presented a replica of the ICRISAT Ganesha idol to Dr Dar in recognition of his services to the Institute. Engraved on the plaque of the idol is “William D Dar, Director General from January 2000 to December 2014, whose dynamic and visionary leadership of ICRISAT fostered science with a human face, and through its network of partners, advanced inclusive market-oriented development for the poor of the semi-arid tropics”. “He is one of the most extraordinary leaders, very efficient, and incredibly responsive. His vision helped ICRISAT though the difficult times and helped the Institute achieve an unbelievable turnaround,” said Governing Board Member, Dr Meryl Williams. Dr Williams along with the Board Chair thanked Mrs Betty Dar for her support to Dr Dar’s journey. Naming ‘Team ICRISAT’ as the “strength of the Institute”, Dr Dar earned a distinguished place of honor in the annals of ICRISAT’s history, and especially in the hearts of all those who have worked with him. 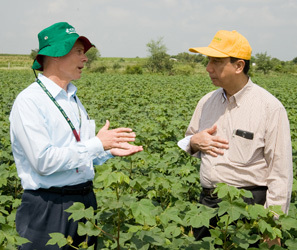 Dr David Bergvinson will replace Dr Dar as the Director General of ICRISAT for a five-year term, starting January 2015. The Governing Board also honored Dr CLL Gowda, Deputy Director General-Research, for his 39 years of service to ICRISAT. Dr Gowda also served the Institute as the Global Leader of Crop Improvement Program, and Director of the Grain Legumes Research Program. “Dr Gowda is a man who put the Institute above himself and that is a testimony to his character. I have a tremendous amount of respect for Dr Gowda. He is a true inspiration to young scientists. He represents the highest caliber of human quality,” Dr Madramootoo said. .
As the Cereals and Legumes Asia Network Coordinator, Dr Gowda has strengthened R & D capacity of 13 countries in Asia. He was also one of the pioneers who initiated the Public-Private Partnership for Hybrid Parents Research Consortium at ICRISAT. 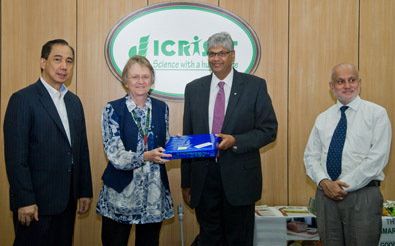 “We are grateful to your services and contributions and the encyclopedic knowledge you possess on agriculture and ICRISAT,” Governing Board member Dr Deborah Delmer told Dr Gowda. The author of more than 320 publications, Dr Gowda has received more than 33 awards and recognitions from various professional societies and institutions across the world. 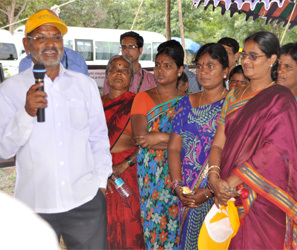 “The smile of a farmer will always be my deepest satisfaction,” Dr Gowda said. Drs C Madramootoo, WD Dar and S Ayyappan presenting a token of recognition to outgoing Board member Dr M Williams. The Board also honored Mr Prasanna Kumar Mohanty, who served ICRISAT as the ex-officio member of the Governing Board from June 2013 to May 2014. 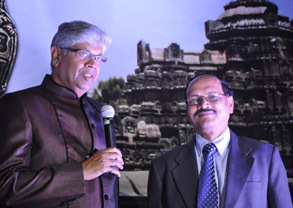 Mr Mohanty held several important positions in the Government of India and Andhra Pradesh. In his last posting, he worked as the Chief Secretary to the Government of Andhra Pradesh. “The Board extends a special thanks to Mr Mohanty for helping strengthen the relationship between ICRISAT and Andhra Pradesh,” Dr Madramootoo said. Mr Mohanty thanked the ICRISAT Director General, and the Board members for their support to him as well as to the State of Andhra Pradesh. Dr Gowda and Mr Mohanty were also presented with tokens of recognition by the Board at the Governing Board Dinner on 24 September. A sustainable environment is the need of the hour. The surge of global warming and more recently the drought witnessed in some parts of the country and abroad calls for immediate steps to mitigate the effects of drought and create a more sustainable future. To achieve this, ICRISAT and Ramoji Film City will be joining hands to create a better environment to live in. ICRISAT and Ramoji Film City signed a MOA (Memorandum of Agreement) on Sustainable Management of Water Resources and Sustainable Agricultural Development through the establishment of an Agriculture Theme Park at Ramoji Film City, Hyderabad, India. “It is an individual’s responsibility to contribute to the environment they are living in. This collaboration between Ramoji Film City and ICRISAT creates scope for developing a sustainable environment. I would personally consider it to be the first step towards sustainability. 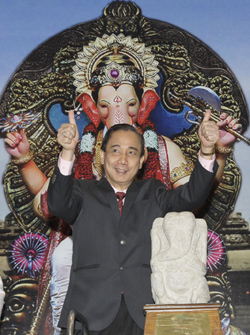 The battle is not won, but just started,” said Mr Rajeev Jalnapurkar, CEO of Ramoji Film City. “The theme park will highlight the importance of agriculture in dryland areas as well as irrigated farming systems. We are focused on disseminating highly relevant technologies for Indian agriculture and make an impact,” ICRISAT Director General Dr William D Dar, said. “It is also important to engage with youth through various means to spread the message of sustainable agriculture, efficient water use and sustainable development. 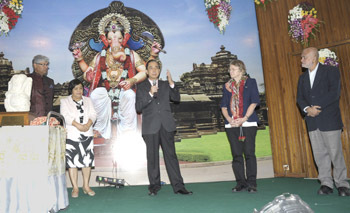 The Agriculture Theme Park in collaboration with Ramoji Film City is one such initiative to reach out and spread the importance of these ideas,” he added. 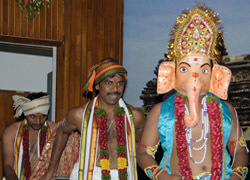 The use of Ramoji Group’s media outlets to reach farmers with the latest technologies and practices. The Ramoji Group has a reach to millions of people not only through the film city but also through the different forms of media including TV and print. Giving ICRISAT access to this media will help farmers get better access to world class scientific developments. The partnership was formalized with the signing of a Memorandum of Agreement (MoA) between Ramoji Group and ICRISAT, at an event at the ICRISAT headquarters on 24 September. 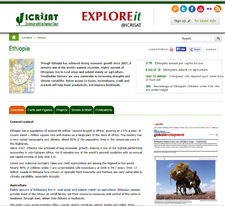 Profiles of the countries where ICRISAT has undertaken major research work have now been included in EXPLOREit@ICRISAT. The profiles provide access to the rich collection of scientific materials and agricultural achievements and challenges in these countries. videos and data sources of these countries.